Some interesting projects are in the pipeline for later this year. Our secretary Marcia Begg is well under way with planning a festival in conjunction with Parks Vic over the Cup weekend in November. Lots of interesting activities are on the way, including an art show, catering and other events. We will be stepping up marketing as this proved very effective for the Lady Bird event at Easter. Marcia needs your offers of help and any assistance will be appreciated. The ‘Members release and Display’ of Vireyas at the Olinda Hall, on 9th September from 10am to 5pm is going ahead, and we are looking forward to seeing you on the day. 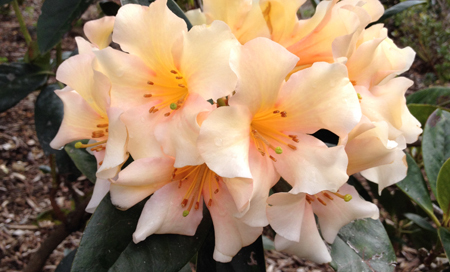 New Vireya releases will be offered by Andrew Raper from Rhodo Glen Nurseries.